Rosa Parks Bike Club has come to an end and we’re proud to announce 13 graduates! Each graduate received a certificate, lights (it gets dark early during the school year and our participants want to be as visible as they can be riding home from school in lower light conditions), and a multi-tool. We held a graduation ceremony, calling up participants one at a time to honor their accomplishment, while the rest of the club cheered encouragement. Awarded with their certificates, we rode each participant home with their newly earned bicycles. Each graduate planned a safe route from the previous house to their own home. Our last participant even rode in front of the instructors, successfully following all laws of the road while using her hand signals and staying alert to her surroundings. We couldn’t be more excited! 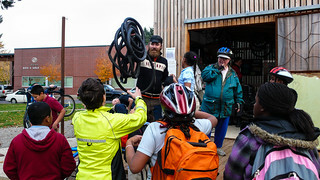 Right across the street from Rosa Parks Elementary School, there is something that not every school has – a Bike Repair Hub. 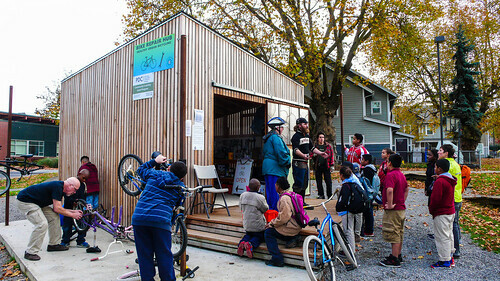 Housed in a small wooden building and surrounded by a Bike Skills Park, the Hub is a bike repair facility supported by volunteers. Some of our Bike Club participants are regulars here, showing up after school to help others fix their bikes, but since Bike Club aims to enroll kids who don’t have bikes (or have significantly out grown their bikes and their families cannot afford a new one), most of us hadn’t really spent time at the Hub. Tim (a Community Cycling Center mechanic), Linda (of We All Can Ride), and Scott (all around bike volunteer extraordinaire) were already immersed in repairs when we arrived, along with a group of local kids. Tim took the time to talk to us about the Hub and we were excited to get involved – did they have anything we could do to help out? They certainly did. Tim produced a pile of tubes in need of patching and lent us a couple of floor pumps. We headed to a nearby open area where Andrea taught us how to fix flats. First, we had to find the hole. We did this by using our senses of sight, hearing, touch, and smell. We looked for holes and found a couple. For holes we couldn’t see, we pumped up the tubes and listened for the hissing sound of air leaking out. We held our cheeks close to the quieter tubes to feel for the leaking stream of air. And some of us could smell a faint odor of talc coming out of the tubes along with the air. None of us tried tasting the tubes, since that sounded gross and didn’t seem helpful. Once the holes were located, we marked them with an X in permanent ink. Then we used the sandpaper from our patch kits to rough up an area around the hole bigger than our patches (which are about the size of a nickel). When we finished roughing up the tubes, we applied some vulcanizing fluid, using a spiral motion to spread it out over the entire sanded area. We waited to let it dry (Bike Club Pro Tip: This is a great time to check the inside of your tire to find the cause of your flat!) and then applied our patches, taking care to place the center of the patch over the hole. When done, we pumped up the tubes to see if our patched held securely. They did! So we returned them to the Hub and, with our extra time, rode around the skills park, testing our balance and handling skills.